Fridays in Manila are associated with Quiapo and the devotion to the Black Nazarene. People flock to Quiapo Church to hear Mass or pray at the Basilica, which is arguably among the most popular for Roman Catholics. Fridays are regarded as feast days dedicated to the Black Nazarene and since many people go to Quiapo Church throughout the day, there is almost always traffic congestion in the area. These days, however, any weekday is a congested day in that area what with more vehicles and more people coming to this area or just passing through. 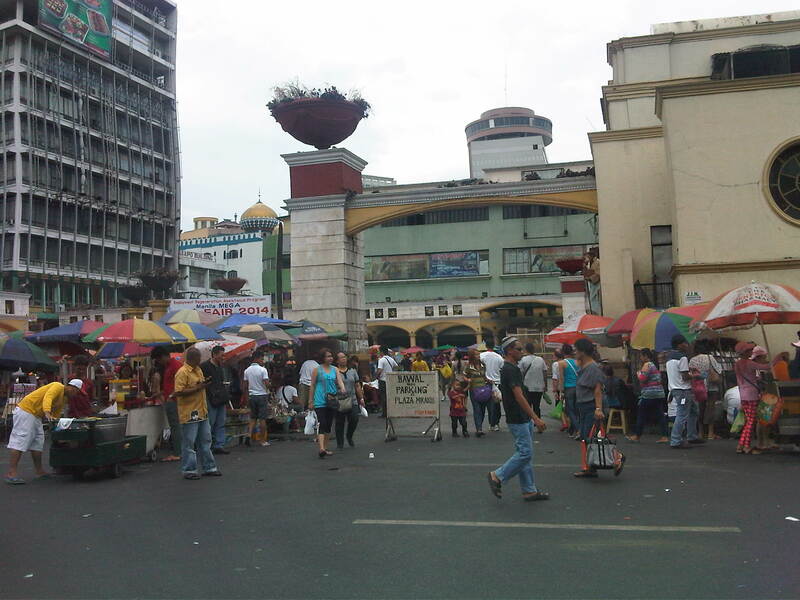 Espana Avenue ends at its junction with Quezon Boulevard and turning left leads the traveler to the Quiapo District. The photo shows heavy traffic along the underpass and the elevated LRT Line 2. Quiapo Church is just beside Quezon Boulevard and jeepneys loading and unloading passengers occupy up to 3 lanes nearest to the church. There is a door at the side of the church along Quezon Boulevard and people seem to be everywhere even the middle of the road as they walk or wait to ride a jeepney. Historic Plaza Miranda in front of the church is witness not only to a lot of the frenzied processions during the feast day of the Black Nazarene every January. Plaza Miranda has also been a venue for many political rallies including the infamous one in the early 1970s that was among the triggers for Martial Law. On “normal” days, the plaza is home to vendors, fortune tellers and other denizens of this area. There are other popular churches around Metro Manila that attract a lot of people throughout the year and not just during feast days. Among these are Baclaran in Pasay City (Our Lady of Perpetual Help), St. Jude in Manila, Sto. Domingo in Quezon City, San Agustin and the Manila Cathedral in Intramuros, Manila. Nearby in Antipolo is the Shrine to Our Lady of Peace and Good Voyage. These churches are among the busiest especially on certain days of the week (e.g., Wednesdays are for Baclaran, etc.) and with the coming Holy Week, a lot of people are again expected to flock to these churches for the Visita Iglesia tradition. Hopefully, these devotions are really a manifestation of faith rather than the pretentious kind where the road trip is more touristy than religious or prayerful. By d0ctrine in Governance, Land use, Parking, Policy, Traffic Management on April 11, 2014 .